Oldale is a small little town with not much to it. 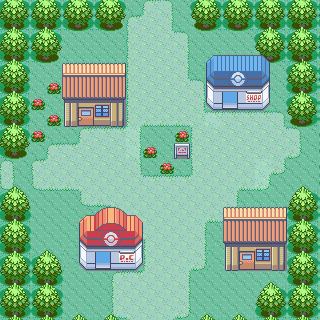 Probably the least visited town by players, it's nothing more than a stop on the way between Littleroot and Petalburg with a connection to the north that links to route 110, but is inaccessible until much later in the game. If you speak to the man in the first house on the right as you enter Oldale, he will give you a free Potion. If you haven't defeated your rival, you will not be able to proceed to Route 102, nor will you be able to purchase additional Poké Balls. While you can use the Poké Center or purchase some items, you will need to head north and win against your rival before continuing with the game. Travel northward up Route 103. There still isn't much to do here after defeating the rival. Once that you have received your first set of Poké Balls, you can buy more of them from the Poké Mart in town. Buy 10 Poké Balls and you'll receive a Premier Ball for free! The Premier Ball has the same catch rate as a regular Poké Ball, but it looks nicer. Don't forget to replenish your Pokémon's health at the Poké Center, especially if you damaged a Pokémon that you then caught (Pokemon sent to the PC are automatically healed). You can head north back to Route 103 where you fought your Rival and attempt to catch a Wingull. Also try to catch a Zigzagoon because his ability is very useful for beginners. (Either for some free loot that you normally wouldn't find this early, or for the vast amounts of money that selling said items can net you. Just make sure to take the items from the zigzagoon, or it won't find any more.) Otherwise, that direction is a dead end. When you're ready, you can now head into Route 102 which was originally blocked by a man studying a rare Pokémon's footprints that turned out to be his own. This page was last edited on 24 November 2018, at 01:48. This page has been accessed 173,777 times.